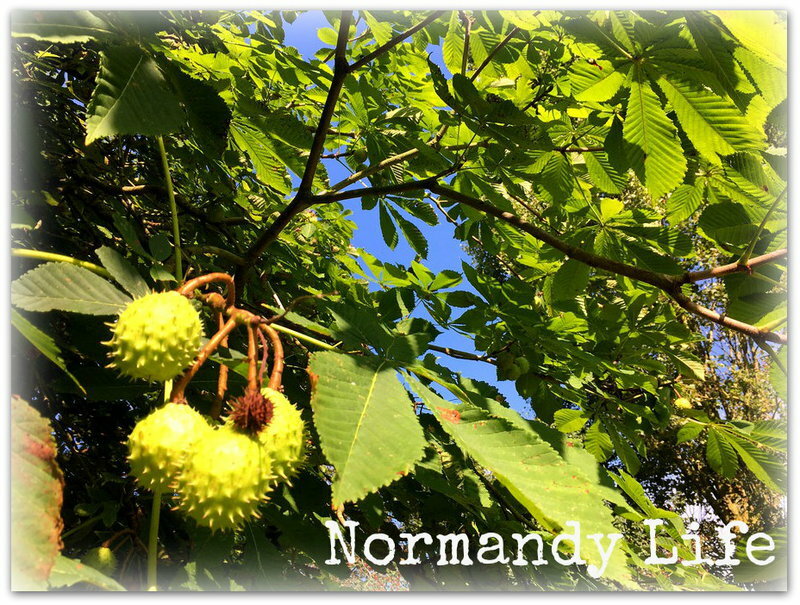 Normandy Life: I scream, you scream, we all scream for Ice Cream! July, it seems, is Ice Cream Month and the 17th of July is National Peach Ice Cream Day according to my list of American Food Holidays! Would you like to join me in the garden to celebrate? Peach Melba Knickerbocker Glory - a Barney Desmazery Recipe from BBC Good Food. you're probably going to want to try it yourself! This one is yours, grab a spoon and dive in! You can even dip the madeleine into the sauce, I won't watch, promise. and a large handful of flaked almonds, lightly toasted. Blitz half the raspberries with half the sugar and a splash of water to make a raspberry sauce, then tip into a small bowl. In a separate bowl, whisk the cream with the remaining sugar until stiff and spoonable, then set aside. Thinly slice the peaches. In tall sundae glasses, layer the peach slices, raspberries and raspberry sauce, finishing with scoops of ice cream, a generous spoonful of whipped cream and a scattering of flaked almonds. Serve straight away with long spoons. Mosaic Monday with Mary @ the little red house. one of my favourite blog parties. by clicking on the links above or on their buttons on my sidebar..
Just had one! Lovely gardens and that ice cream. Yummy! Your garden is just delightful. I would love to join you for a chat and one of those delicious ice creams. The chair, the table, the flowers - it's all like a magazine shoot. I'm so glad I discovered your blog. Your garden is absolutely gorgeous. I love your hydrangeas! 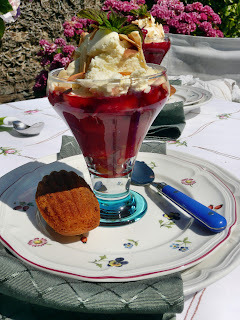 The peach ice cream dessert looks delicious; and since I love rasberries and peaches, that should be right up my alley. I saw your Bastille Day post yesterday, but didn't get a chance to comment. Hope you enjoyed the celebrations. We are still watching the Tour de France at our house. 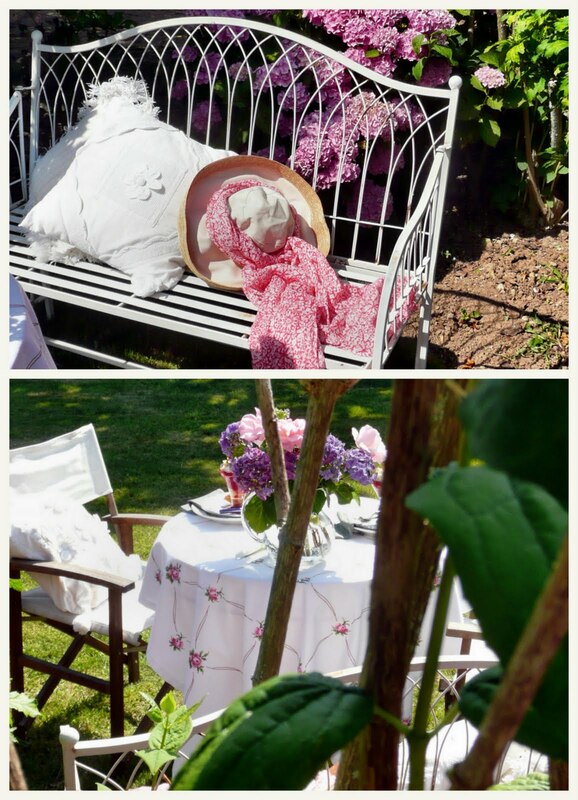 I plan to do a French-themed tablescape very soon. Thanks for sharing your lovely food and flowers with us! 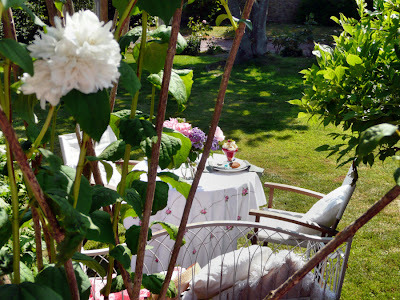 Yes, it would be a pleasure to sit with you in that lovely garden, eating ice cream. It is terribly hot here. That ice cream looks so good!!! It's so hot here and anything cool looks really refreshing! I need to freeze my container and make some homemade ice cream -- except I'm afraid that I WILL EAT THE WHOLE THING!!! Thank you so much for joining in on the fun. Your sundae is so pretty and sounds delicious. I would love to share one in your lovely garden. In a word: "YUMMY!" - thanks for sharing, have a fun pink weekend! Such a gorgeous setting. It is a perfect place to enjoy ice cream. I am your newest follower! Oh perfectly lovely in every way! 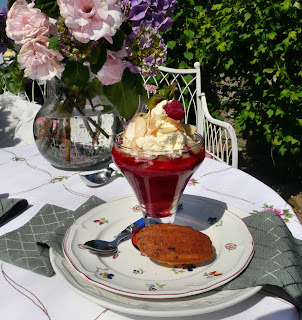 I think that raspberry sauce would work beautifully with so many ice creams. I'll definitely be giving it a try. ummm...sounds so delicious...and the setting, very beautiful, indeed. I don't know what says 'summer' more - the setting or the ice cream. I'd like to eat a flute of ice cream and then drift off for a nap right there. dear Maggie, I would love to sit anywhere in the beautiful garden with you, and beautiful it is. The ice cream looks delicious, and perfect for all this hot July temps we are having. Thanks for sharing your lovely recipe..........yummy. Hope your weekend is fabulous. Maggie, I'm on my way. I hope my ice cream doesn't melt! Maggie, Your ice cream looks great and you have a beautiful garden. You are so lucky to have wisteria! I long to grow wisteria, but not sure I have the room for such a large plant. I don't know which is more beautiful, Maggie. Your garden (which I would love to sit in with you, talk, sip tea and enjoy) or the raspberry ice cream. Delightful! And that color is divine. Yum! 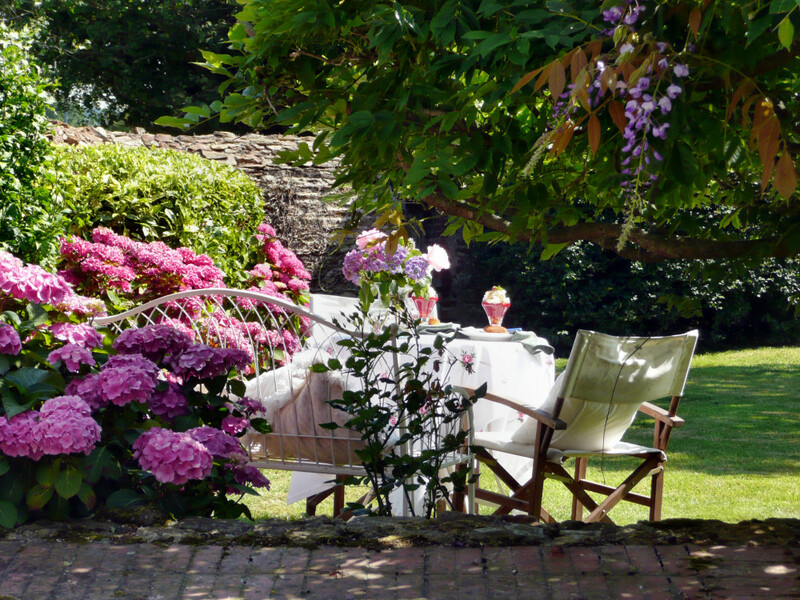 I'd love to join you in your lovely garden! What a gorgeous setting for an ice cream! 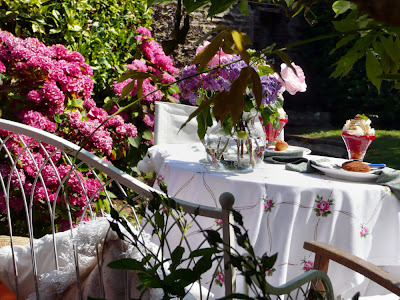 I am in love with your sweet table cloth and your garden looks lovely. Your ice cream creation is calling my name! I do have fresh raspberries but need to seek out some peaches. Its so pretty! Thanks so much for coming to the Social this year. Mark your calendar for next year! Okay, not only beautiful surroundings but ICE CREAM too ! Yummy! And the flowers are beautiful. Happy PS! Oh my goodness...what loveliness! I must try your recipe and I love the name! Oh my gosh, this is beautiful--it looks like a magazine...WOW!!! A gorgeous dessert in a most beautiful garden, can't ask for more than that, what a great way to celebrate! The Peach Melba looks fantastic. Beautiful photos and delicious ice cream. This looks so devine. 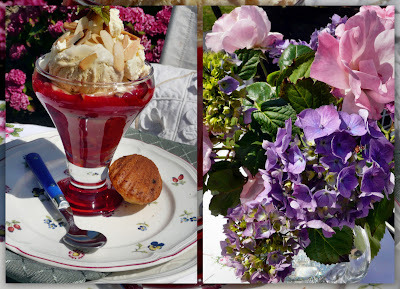 Your ice cream creation is magnificent and coupled with your gardens, just amazing. Thanks for being a part of Seasonal Sundays. Wow that ice cream looks divine but as you know from meeting Phil and I we are both overweight so we will look, droll and not eat!!! I am so thrilled that I found your blog. Your garden and pictures are a feast for the eye!! Will save the ice cream which looks utterly delectable for my summer..
Love the ice cream sundae dish that you used...it makes the ice cream look extra special and I am sure that it is delicious. the hydrangeas are stunning. I wish mine were "fat" like that. Hi Maggie, I was delighted to have you visit The Vintage Nest and hope to see you often. I had a big bowl of ice cream last night....a real treat for me. Have a wonderful week. what a beautiful setting! Everything looks just gorgeous! And the ice cream looks and sounds delish! Hello again Maggie- Your homemade ice cream success is inspirational ...I'd love to duplicate some of those wonderful flavours I sampled in Italy. It seems like you are really enjoying the days of summer! Will have dinner first (fish) and then maybe an icecream.......Wonderful mosaic. Well I never knew there was a special day for ice cream. Guess your lap top survived the dampening it had! Your orto is looking really good,ours not so good this year due to excessive heat at wrong time. By the way thanks for your comments on The Alchemist I was disappointed it was not to your taste after all. I enjoyed my stay in the beautiful garden. The table is gorgeous. What a delicious sounding dish for an ice cream social. I wish I was attending one in your beautiful garden. it all looks so delicious - and such a beautiful setting! Happy MM back to you too Maggie! Oh boy, I sure do hope that will work with canned peaches as I don't know if I can wait until summer to try this! What a yummy recipe! I hope you have been enjoying summer. My in-laws are visiting Mr Attorney's sister who lives in Paris and they said it has been quite cold at times. Your garden is looking so pretty Maggie so I guess the weather must be okay. Well, thanks again for sharing the yummy recipe. Hope the rest of your week is wonderful! This setting, and the ice cream, certainly looks inviting! My favorite combo for a hot Summer day - anything with peaches and raspberries! This looks and sounds so yummy! Right now I'm on a sorbet kick - especially raspberry - find it so refreshing.